Hoch aufgelöste Musikproduktion mit klassischem Analogsound. Das Apollo FireWire verkörpert die 60-jährige Erfahrung von Universal Audio in der Entwicklung und Fertigung von Audiogeräten. Es profiliert sich mit UAD-2 QUAD-Core-Processing und dem enthaltenen, preisgekrönten UAD Plug-Ins-Bundle - alle Komponenten können für nahezu latenzfreie Aufnahmen und die Klangbildung wie in einem klassischen Analog-Studio genutzt werden, ohne den Host-Rechner zu belasten. Apollo FireWire bietet vier Unison-fähige Mikrofonvorverstärker, die Aufnahmen über akribische Preamp-Emulationen von Neve, API, Manley und Universal Audio ermöglichen. Exklusiv in Apollo Interfaces entwickelt die Unison-Technologie die Klangfarbe dieser heiß begehrten Röhren- und Transistoren-Mikrofonvorverstärker zu 100% - inklusive ihrer Eingangsimpedanz, den "Sweetspots" ihrer Verstärkungsstufe und dem Schaltungsverhalten auf Komponentenebene der Originalhardware. Das Geheimnis von Unison liegt in seiner Hardware-Software-Integration zwischen Apollo´s Mikrofonvorverstärkern und dem integrierten UAD-2 QUAD Core DSP-System. Schalte einfach ein Unison Preamp-Plug-In in den Mikrofoneingang und tauche in den klassischen Sound ein, den die weltweit am meisten aufgenommenen Mikrofonvorverstärker erzeugen. Im Lieferumfang des Apollo FireWire ist eine Plug-In-Palette unglaublicher Analogemulationen enthalten, darunter die weltweit einzigen authentischen Emulation von Teletronix® LA-2A, 1176LN und Fairchild® Kompressoren, der legendären Pultec® EQs und des Unison-fähigen UA 610-B Tube Preamps. Die von den weltweit anerkannten Coding-Ingenieuren bei UA entwickelten Realtime Analog Classics Plug-Ins setzen den Standard, nach dem alle anderen Plug-Ins beurteilt werden, die Hardware emulieren. Vom warmen Röhrenklang des Pultec EQs auf Gitarren, über das sanfte Limiting des LA-2A auf Vocals, bis hin zum originalen Pumpen der Fairchild 670 Kompressoren für Drums, deine Aufnahmen werden sich hörbar durch druckvollen, klanglich komplexen Sound von anderen Recordings unterscheiden. Über die enthaltenen Realtime Analog Classics Plug-Ins hinaus kannst Du in den kompletten Katalog der preisgekrönten UAD Powered Plug-Ins eintauchen - darunter klassische EQs, Kompressoren, Hallgeräte, Bandmaschinen und vieles mehr - unabhängig von der Puffergröße Deiner Audiosoftware und ohne die CPU Deines Rechners zu belasten. Mit exklusiven Emulationen von Neve, Studer, Manley, API, Ampex, Lexicon, Fender und weiteren† ist es, als hätte man ein grenzenloses Analogstudio auf einer einzigen 19"-Rackeinheit. Im Gegensatz zu konkurrierenden Interfaces, stehen Dir diese DSP-basierten Plug-Ins auch zum Mischen in der DAW zur Verfügung. Wenn dein Studio und deine Projekte wachsen, kannst du nun zwei Apollo FireWire oder zwei Apollo 16 FireWire Interfaces nahtlos über Firewire koppeln, um mehr I/O und DSP-Kapazitäten zu verwenden. Mit der Console 2.0 Anwendung des Apollo FireWire — einer vollständige überarbeitenden Version von Apollo`s ursprünglicher Console Software — kannst du jetzt auf mehr als 25 neue von Anwendern geforderte Funktionen wie Channel Strip Presets, Drag & Drop Funktionalität, dynamisch skalierbare Fenster und andere zugreifen. Solidly built, sounds great. Plugins are great too. Mostly used for recording drums with an Audient ASP 880. The best recording unit ever!!! Solidly built, sounds great. Plugins are great too. Mostly used for recording drums with an Audient ASP 880. I was pretty dead set on the Apogee Symphony due to the reputation of the converters and the expansion options. However after A/B'ing the two, I decided to pick up an Apollo Duo (slightly more "open" field of depth IMO). The I/O options are just enough and if I ever need more in the future, the daisy chain option is available. The onboard pre's are very transparent and provide a ton of headroom. I rate 4/5 because of my issue with UAD-2 (running on MacBook Pro with Retina 2.8 GHz i7 quad, 16 GB RAM, 512 SSD). Everyday I get a popup (from Console) that tells me that plugins have been disabled. Always remedied by a quick restart, but is not ideal in the middle of a session! Overall, it was a major improvement! I have been a Digital Performer and Motu hardware user for 8 years. Motu are making solid products. In April last year I run into a promotion by UA for the Apollo hardware plus $1000 plug-ins. I decided to take my chance and move into the UA platform. I have to say that sound quality is absolutely a giant step forward. 3. Free plug ins....Stuter, SR88, Lexicon, Pultec Pro, Little labs voice of god. 1. Some firewire issues when running plug ins at times. 2. bandwidth adjustment can be tricky. 4. Some instability of the audio hardware to drop once and a while when a session is loading. Again I am not sure if this is something to do more with my studio setup or not. As often read... there are many good reasons to work with this Interface. BUT two things annoy me every day. If UA could solve this with updates the Apollo would be perfect. First problem: even with the (expensive) Thunderbolt card installed, the audio I/O speed is same as FireWire already offers. When I bought the Apollo UA told the press that you can get PCIe speeds with this interface. It was not true... but this was my main reason to buy the Apollo. The TB option card brings more speed only to the UAD PlugIn section. Second problem: the "UA mixer engine" is' extremely CPU hungry. It is still in 32bit... maybe Mac OS has problems translating it to the 64bit OS at the system level. Infelizmente tenho que usar o delay compensation do protools com os plugs da UAD para compensar os muitos atrasos dos plugins,e não estar conseguindo usar minha project mix como controladora por estar conflitando com a Apollo quad... mas do resto achei a melhor compra minha dos ultimos tempos e creio que irei adquirir muitas outras coisas da UA em breve... Pena a apollo quad não vir com mais plugins já na compra. Mas de qualquer forma estou muito satisfeito. Bruno Brito. 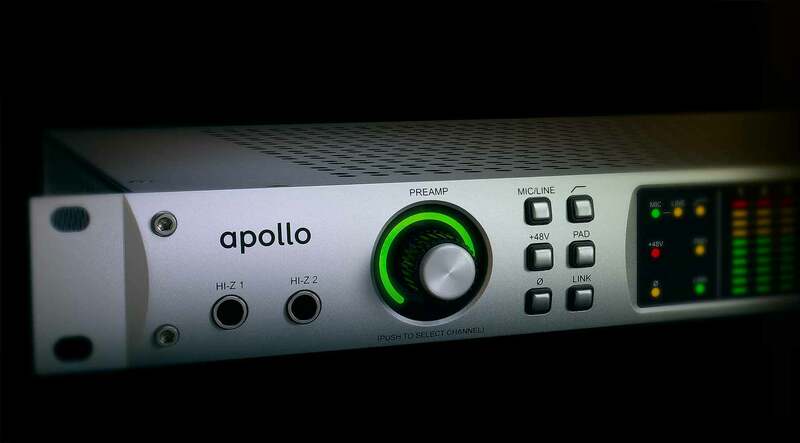 The Universal Audio Apollo is everything the buzz has promised - powerful processing, pristine audio, straight forward operation. Easily configures with DAW (I'm running Nuendo 5), and the dual headphone outputs coupled with the Console app, make it a breeze to move from tracking to editing and mixing with a quick turn of a dial. For the first time, I find the DAW recording process flowing uninhibited from idea to execution. And of course the plug-ins. Yes, yes, and yes. I have encountered some recurrent issues with taxing the FW800 bus, even after adjusting the bandwidth much lower. I'm sure when I move to a Thunderbolt hard drive, or perhaps the card for the Apollo, this issue will evaporate. I was surprised as soon i heard the sound quality. Open, clear and I can hear where everything is placed in the sound field. The mic pres are excellent. They sound comparable to a lot more expensive pres out there on the market. The fact that I can record direct with a plugin on it without latency thats revolutionary. UAD plugins are top notch and creating music have been so much easier now and faster. I can use the monitor our direct the my speakers and thats convenient. Its like UAD have taken the best of everything and put it in one box. This piece of gear has revitalised everything in the studio. It just makes all recording session fluent and efficient. The pre-amps are ultra clean and make everything sparkle and that combined with the UAD plugin DSP processing and the console gives super control of the sessions. I look forward to the thunderbolt card release as this will undoubtably change everything even further. The Apollo is the new heart of the studio. I Love it from the moment i heard it. It is clear! and that is perfect for use with the uad plugs! looking great easy to use. what can i say more. i'm very exited about it. I'm most impressed so far, especially with the DSP and the plug ins. I only wish I could afford to buy more! It seems like a solid piece of kit, and I'm pleased with the audio quality. This is the best single purchase I have ever made, turns out my hard earned money has been very wisely spent because the quality of my recordings have finally arrived in the pro domain which is really good news as I have struggled for years to get the sound I so desired. I recently recorded a solo classical piano album with DPA mics and my new Apollo and the results are astounding. My only grumble is how few plug ins were included as standard for my £2k plus which is the only reason I can't give it the full 5 stars, and y'know if plug ins weren't so prohibitively expensive for us small guys we would all buy and use them more, anyway enough of the politics overall absolutely thrilled with my new Apollo. I just purchased a UA Apollo. Of course the first thing we do when we get a new interface is listen to all our mixes done with the old hardware. Well, I was blown away at the clarity & detail the Apollo brought to my system & I was coming from an RME Fireface 400 that I was really happy with. But the Apollo just really opened up the top end, added an extra level or definition to the midrange (for the first time my dynaudio BM5s are not sounding boxy in the mids!) & opened the soundfield's width & depth. I just just completed my first album mix through the Apollo & the UAD plugins included & I must say the mixes are sounding great. They're translating better & faster. Less mix corrections are needed as making better choices right off! The UA Team has done a great job with the overall appearance and feel of the new Apollo. The front panel is very clean and organized well. The 1U model is held together with steel and aluminum plates. You can toss this thing around. Guaranteed it will still hold together. The unit works seamlessly with the very popular "console" app provided. The routing that can be done in the back end and integrated with your DAW is amazing. Whether you're running old or new mixes, or even songs from your itunes library this unit does a great job at clearing things up and making your music come to life. Would have loved to have seen more "Free" UAD plugins, considering the price. With this unit I am able to make better mixing decisions. I love the sound to the point that I don't believe I need to purchase a summing box. The only issue is I have to bypass the headphones 1 & 2 because I get a scratchy sound when I adjust the volume on both HP jacks. I've, tried it in different outlets, different headphones (3 different) but the scratch is still there when adjusting the volume knob. I've even returned the unit and got another unit and same thing. I thought I was going crazy so I let other people listen to see if they've heard and they've also heard the sound. UA is awsome and offered to fix the issue. I appreciate that but I just can't ship my unit out and wait a week to get it back. too busy. When I set out looking for a new audio interface I wanted something that had mic pres, top notch converters, thunderbolt compatibility, two sets of headphones and the incredible UAD processing. The Apollo is all of these things and more. Its effortlessly easy to use and sounds absolutely incredible. I would have liked it to have midi I/O as well as a dim switch on the unit itself, but these are minor things. One thing I didn't know until I got the unit however, is that the ADAT ports are not two separate ports. At 44.1 and 48 kHz port 2 mirrors port 1, at high sample rates using both ports allows more channels. Apart from that it was everything UA says it is. All in all its a fantastic box that lives up to the UA name, and I'm very pleased. The Apollo is pretty much what I wanted. I mainly record acoustic instruments and vocals, but need the flexibility to do drum kits from time to time. The Mic preamps do what I want - provide incredible fidelity of the boosted signal so all the richness of an acoustic guitar remains after the considerable gain increase. Monitoring live with an 1176, a 1073 and an EMT Plate is wonderful. As a player it really gives you confidence to play expressively. I don't like to commit to a sound on recording so I love the flexibility of just monitoring with the plug-ins and fine tuning from within Logic later. All the analogue warmth (of which I'm a massive fan) can be added with the plug-ins and they do this very well indeed. I do mainly overdub recording at my home studio, and had been using MOTU hardware for years -- very reliable stuff, but then one of my clients brought over his $5000 Prism Orpheus that blew me away. I decided it was time to upgrade, but didn't want to spend that amount, so I started checking things out in the $2000 range -- Apogee Ensemble sounded very nice, but then I heard news about the Apollo, and, already being a satisfied UA customer with a 6176 and a UAD-2 Quad, I decided to wait for the Apollo to arrive at my local dealer. Long story short, I LOVE IT !! And I'm glad I waited !! I bought apollo with a lynx aurora 8, and a UA 2/610, together with other things. A HUGE upgrade on my studio. Best thing I could ever do. Apollo is awesome. Good preamps, superb conversion and huge processing power. Don't think apollo as a "interface to record with plugins". I think this is the main "marketing" of UA... But you can buy apollo even if you are not planning to record with plugs. All the rest are superb. Get an apollo and a good AD-DA (like lynx) and you have 16 professional channels. 18 if you have a good 2ch AD Endless possibilities. My last audio interface was the 'flagship' of a big name UK based brand. It had trouble talking with Pro Tools & Logic, I/O operating level issues with my large format console, and several strange sonic issues. it's control software was the most ridiculous user unfriendly creation I have ever tried to use in my career. I decided to upgrade and was advised to consider the brand new UA Apollo. I'd read about it, it seemed very pro and impressive, but I'd been sucked in before. I took a chance with the Apollo, and I must say it's so good, it's the single most significant piece of new gear I now own. The sound is surely as good as it gets, the software is superbly designed, and my mixing console loves it. No more issues.